This book examines the prospects for business law reform to drive economic development in developing countries. It argues that, despite statements to the contrary, cultural factors and other local conditions in developing countries are not properly taken into account in current business law reform programs. Utilizing the city of Dakar as an example, this book investigates the consequences of this lack of fit between local needs and transplanted legal models by examining the potential and actual impact of the OHADA program of law reform on local business practices. Focusing on how managers make decisions and apply appropriate norms in routine business operations, the book documents how contractual disputes arise and are solved in Dakar and the role played by formal law in these processes. 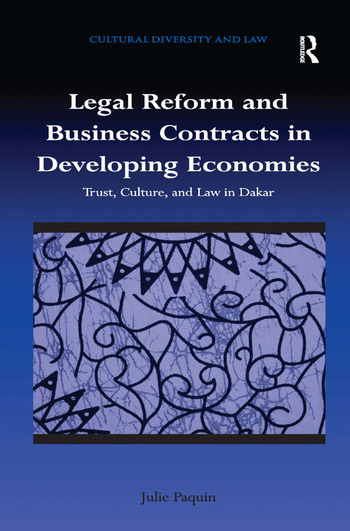 By examining imported law from the point of view of the end-users of legal reforms, the book reveals the complex relationship between formal law, local cultural norms and the activities of SMEs operating in developing economies, and calls for a reconsideration of current law and development theory as well as the role of contract law in business decisions. It will be relevant to all developing countries seeking to align their laws with ’best practice’ as identified by aid institutions. Julie Paquin is Assistant Professor of Law at University of Ottawa, Canada, where she teaches in the areas of private and business law. Her current research interests are in the areas of contract law, international development and socio-legal studies.